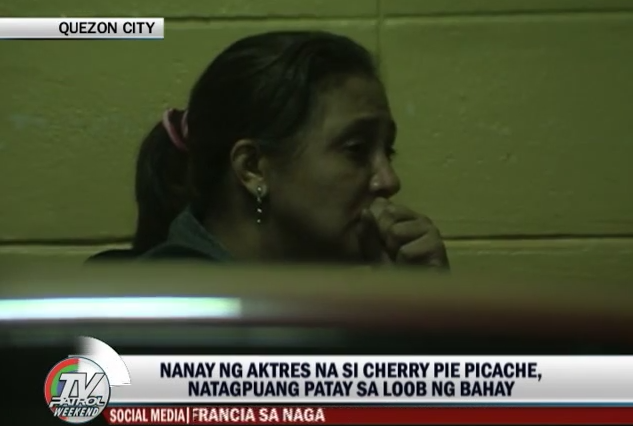 The mother of award winning actress, Cherry Pie Picache was found dead in her house at Barangay Paligsahan, Quezon City during the downpour brought by typhoon Mario last Friday, September 19, 2014. In the midst of the storm on Friday evening, the actress was said to have decided to check on her mother, Zenaida Sison, after her calls were not answered. They discovered that the gate and door seemed to have been opened by force, prompting Picache’s driver, Mateo Mago, to get inside the house and look for Sison. He then found Pecache’s mother dead on the second floor of the house sustaining multiple stab wounds. According to Chief Inspector Rodel, a blood stained knife, a crowbar, and block of wood that was believed to have been used to hit Sison’s head, were found in the house. Robbery had been the main motive as perceived by the police, and there could be a possibility that Sison personally knew the assailants because they seemed to know the outline of the house and the entrances. The suspects even changed their clothes in the house leaving a pair of denim short pants and a striped shirt. The police had now seemed to had a lead but refused to give out the details while hoping for the positive outcomes in the coming days. Though the assailant was still unidentified, Picache voiced out her hopes in QCPD (Quezon City Police Department) and SOCO (Scene of the Crime Operation) to solve the case of their mother’s death. They expressed their gratitude for the immediate and efficient response in the crime.